Focusing on what’s important! My goal as your trainer is to provide you with a training program that not only guides you to achieving your goals but to teach you how to continue on your path to maintaining a healthy active lifestyle. Lori is a lifelong traveler on the path to personal fitness. Some might say she started down the path during her age group competitive swimming days or while playing Little League Softball. Others would tell you it happened when she reached her maximum density and suffered from chronic back and joint pain after her college swimming career came to an end. The when is not as important as the why and how? 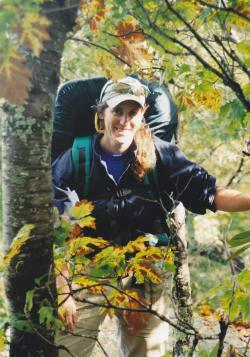 The why, or the importance of, personal fitness became significant during her years as a Forester and Fire Manager along with desires to participate in the activities she loves, such as wilderness backpacking and endurance cycling events. While living on an extremely tight budget, she developed a fitness plan and nutritional strategies that enabled her to lose weight and get in shape to meet the physical requirements and demands of her profession and hobbies. Lori has earned certifications as a Fitness Trainer and Cycling Coach, and has experience designing programs to help individuals to lose 50+ pounds, improve their overall health and fitness, complete 100+ mile bike events, marathons, improve competitive swimming skills, to learn and compete in martial arts. When she’s not working, she’s outside playing Frisbee with her dog, on a day hiking trip or wilderness backpacking adventure, or enjoying a local bike ride.